Have you read the story of Winky and Wonder? Winky and Wonder are two courageous Whisper Children from a mysterious place called Whisperland. Invisible to humans' eyes and unheard by their ears, Winky and Wonder whisper directly to human children's hearts, encouraging them to listen to what they already know deep inside. Told with humor and excitement, these tales of adventure and triumph-over-evil present lessons about virtues, moral choices, accountability for one's own actions, forgiveness, and life's realities. Children and adults are invited to join Winky and Wonder as they discover unseen forces of good and evil while embarking upon important missions to help human children. 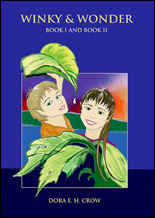 Adults may wish to read the book aloud with children, as this will open up opportunities to discuss personal values and experiences together.